Mazda has announced all the updates in store for the 2019 MX-5 Miata, from its new price to its stronger performance and feature changes. Let’s start with pricing. The 2019 MX-5 will start at $25,730, a $435 increase over the 2018 model year. 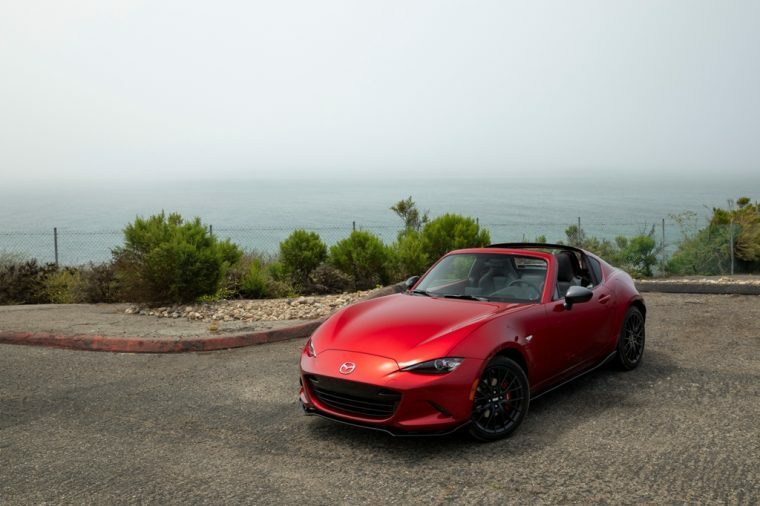 For that bump, though, there are several changes for the new Miata. Chief among these is a boost in engine power. By tweaking the engine composition, the 2.0-liter four-cylinder now produces 181 horsepower and 151 lb-ft of torque. This is an increase of 26 horsepower and 3 lb-ft of torque over last year’s model. Additionally, the 2019 MX-5 will get a new brown soft top color option, a standard tile and telescoping steering column, a standard rearview camera, Metallic Black wheels on the Sport and Club models, available Smart City Braking, and available Traffic Sign Recognition. Then, the MX-5 gets three new options packages. The first two of these packages are i-ACTIVSENSE options for the Sport and Club trims. On the Sport, this includes Smart City Brake Support, Lane-Departure Warning, and Blind Spot Monitoring with Rear Cross-Traffic Alert. On the Club trim, this just includes Smart City Brake Support and Lane-Departure Warning, since the Club comes with the Blind Spot system as standard equipment. The last package, the GT-S, is for manual-transmission Grand Touring models, and includes a limited-slip rear differential, Bilstein dampers, and a shock tower brace. On the hardtop Miata, this last package also delivers a black roof. 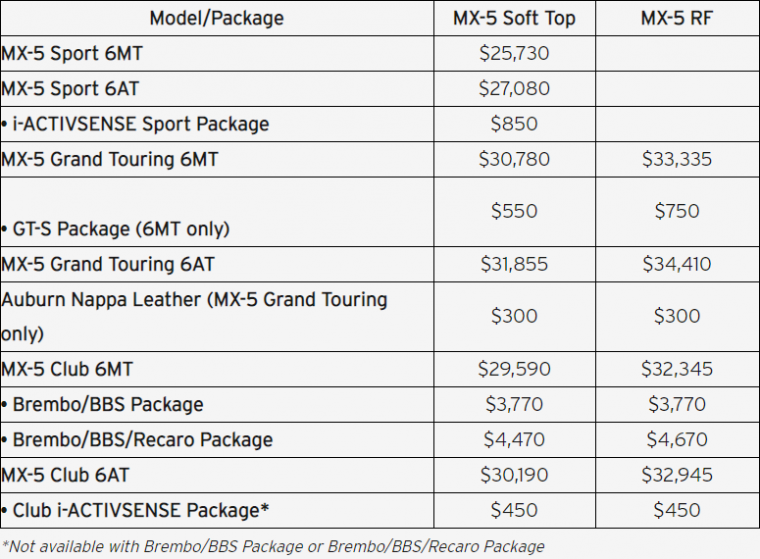 Mazda provided a handy chart of the 2019 Miata’s pricing, which we are including below. In addition, here are the prices for the premium exterior color options.